Animal print, and leopard print in particular, are perennial style staples. That’s what makes them such great investments as you can wear a leopard print blouse, pair of pumps or coat season after season! 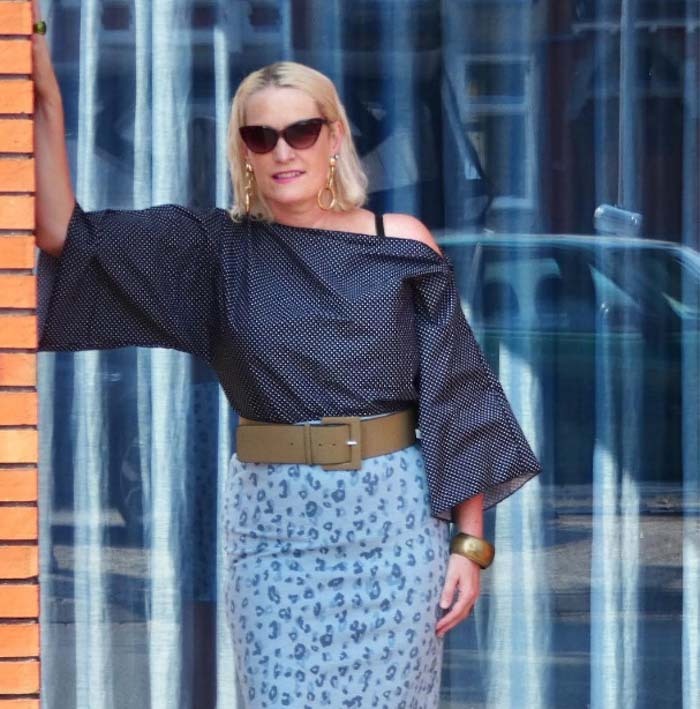 Here is some inspiration on how to wear animal print from 25 stylish 40+ women! We also listed where you can these looks in the shops. Leopard print may be seen as a print for fall or winter. But, it’s also a stylish option for summer. 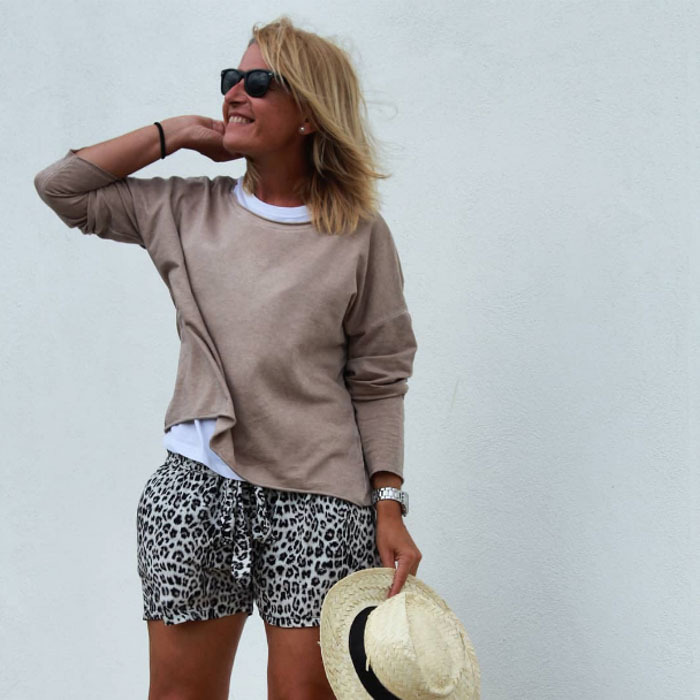 Here, a pair of leopard print shorts works well with other neutrals. 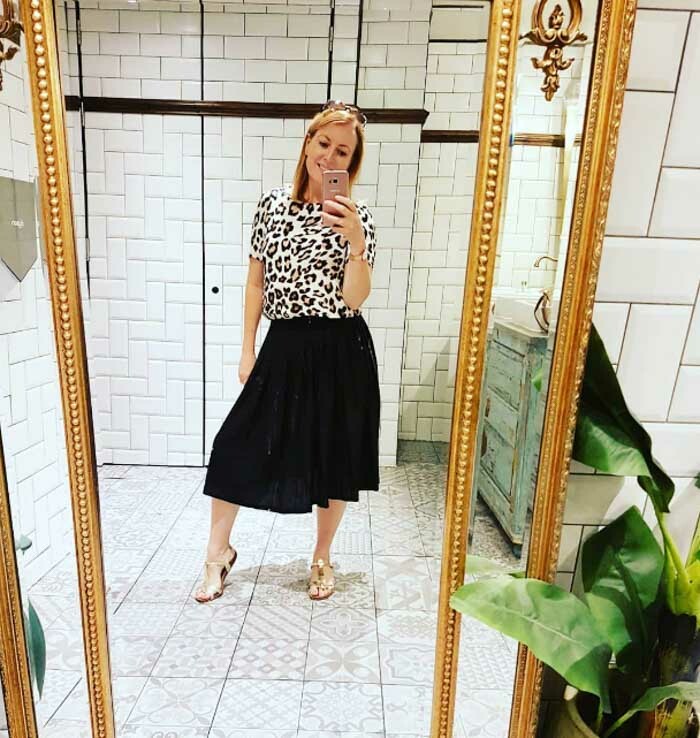 There’s more inspiration here if you’re heading into summer, or going on vacation, on how to wear leopard print in summer. A lesson in pattern mixing! Here heritage checks and leopard print, which are both huge trends for fall 2018, are worn together for an unexpected, yet very stylish, look. The outfit is finished with matching brown booties. There are more ideas here if you’re looking for inspiration on how to mix prints and patterns like an expert. Another great look showing how leopard print can be worn for summer. A full-length print is teamed with a round straw bag and matching hat. It’s an outfit that could also be transformed for fall by adding a biker jacket for warmth! A versatile leopard print dress is worn casually with a jeans jacket and hoop earrings. A leopard print skirt is worn as a neutral here; worn with a bright fuschia top. Chicken optional! You don’t have to go with leopard print! Snakeprint is just as stylish, and also on trend for fall! This dress could be worn any time of year. 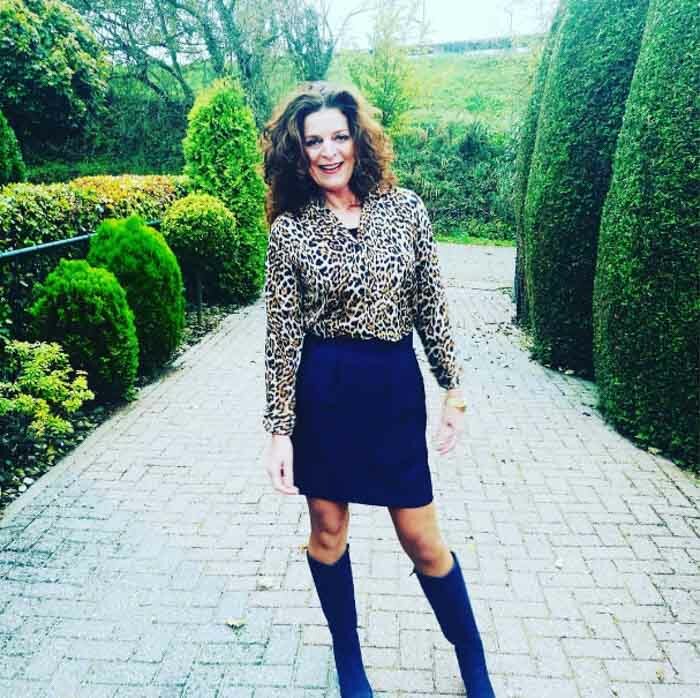 Here, a leopard print shirt is teamed with a blue pencil skirt, and matching knee-high boots. 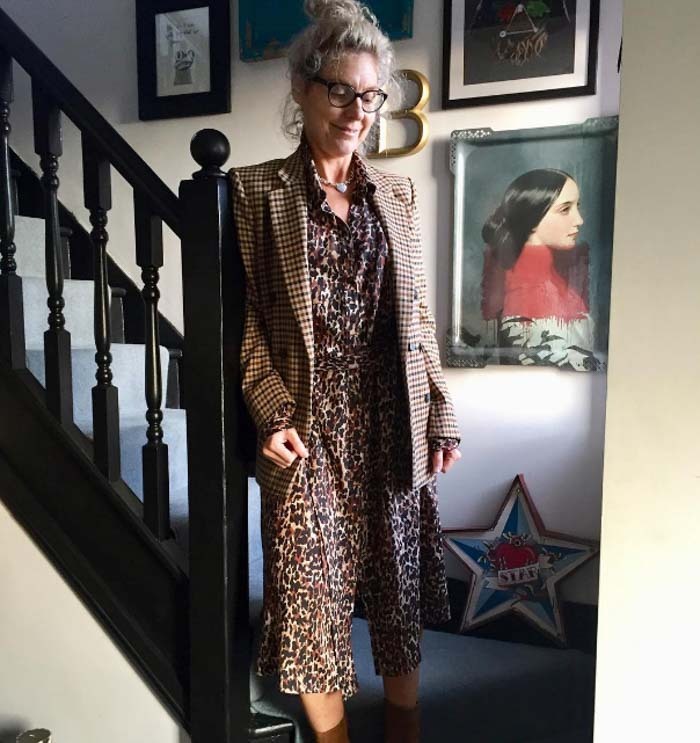 Find more about Nancy in her style interview here. Scarf print dresses are another big trend at the moment. This maxi dress features leopard print and is worn with zebra print boots. 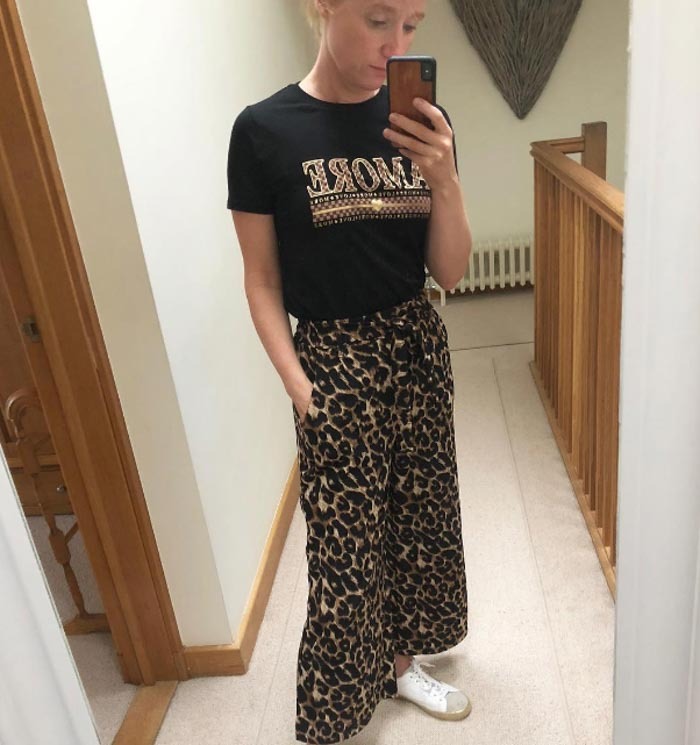 Leopard print pants worn as a casual option, worn with a slogan tee, and sneakers! Another dress which shows that leopard print can be worn in other colors as well as neutral. Here, a green and pink dress is worn with a pink jeans jacket and black tights, along with a black belt. 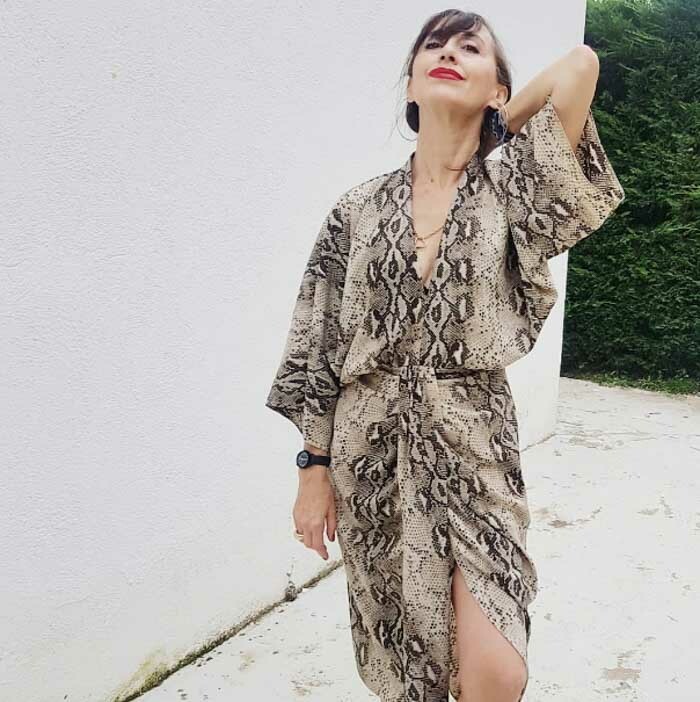 A versatile snake print wrap dress is worn for warm weather with neutral accessories, and a pair of oversized sunglasses! It may usually be worn as a neutral on a background of beige or brown. But leopard print can make an even bolder statement when worn in primary colors. A red suit provides real impact here. The rest of the color palette is kept simple so the whole outfit is red and black. 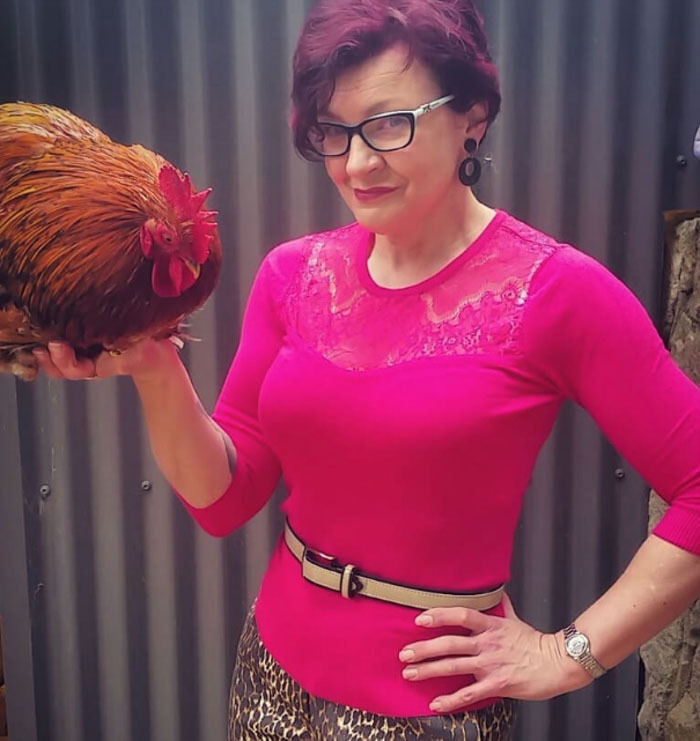 Want to know more about Lisa? You can visit her style interview here. 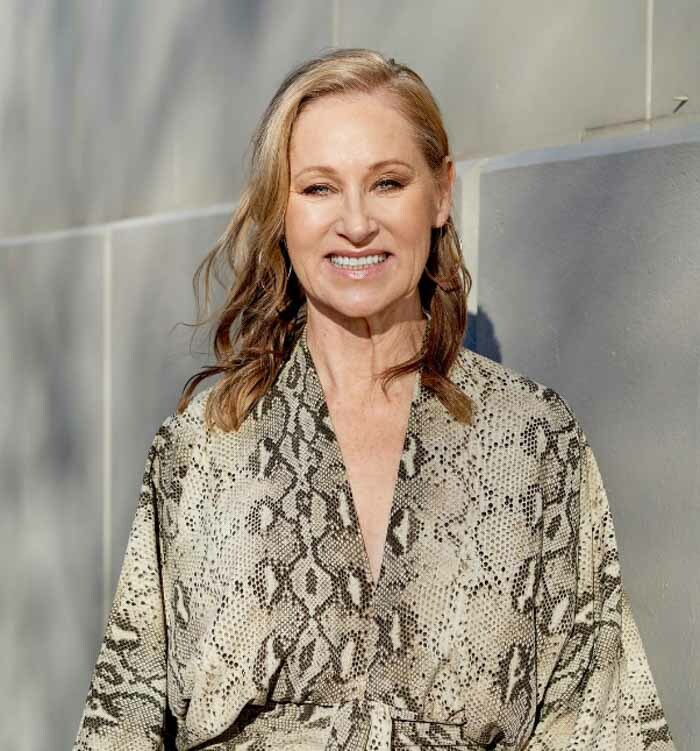 Read more about Lisa’s bold style in her style interview here. 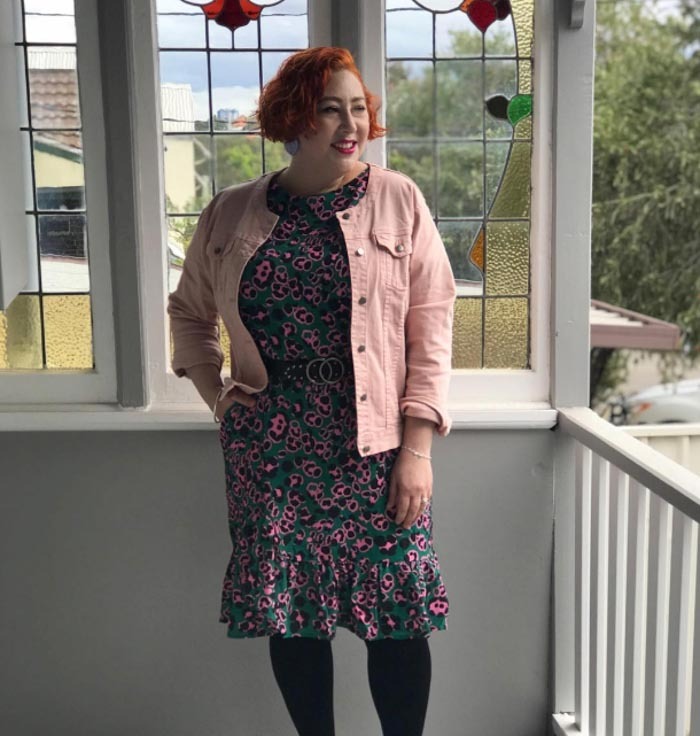 Showing that the size of the print can make a big difference to the way a dress looks. The leopard print dress is left to speak for itself here, with accessories kept simple. Leopard print doesn’t have to be worn as a dress or shirt! 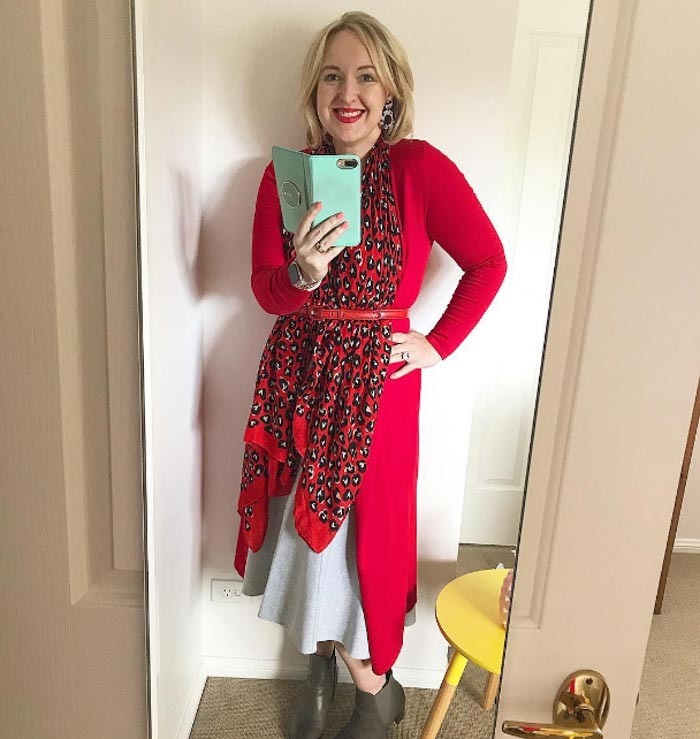 This red leopard print scarf provides a big impact to this outfit. The look also features another big trend – red mixed with pink. A subtle leopard print midi skirt is paired with black, along with a pop of yellow! Another stylish example of print mixing! Here, an unusual blue leopard print pencil skirt is teamed with subtle polka dots and an over-sized belt. Because leopard print usually works as a neutral – unless, of course, it is worn in bolder colors – it can be teamed with other shades. Here, this leopard print shirt dress is worn with yellow pumps. More fabulous pattern mixing! A double-breasted checked blazer is worn along with a pretty pastel leopard print dress. Again accessories are kept simple, with a bangle and hoop earrings finishing off the look. Another versatile leopard print piece! This maxi skirt is worn with a pink tee and moto jacket. 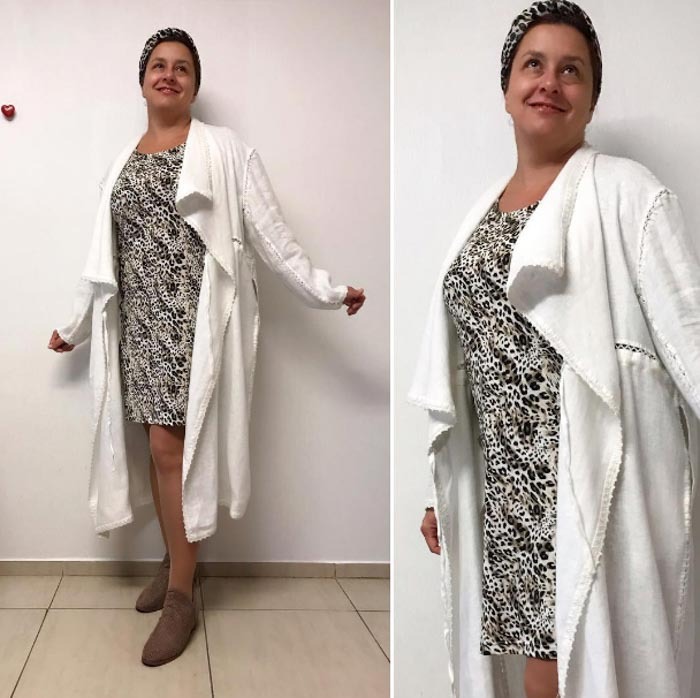 A transitional look, here this leopard print dress is worn with a white duster jacket, along with a matching headband, and beige booties. 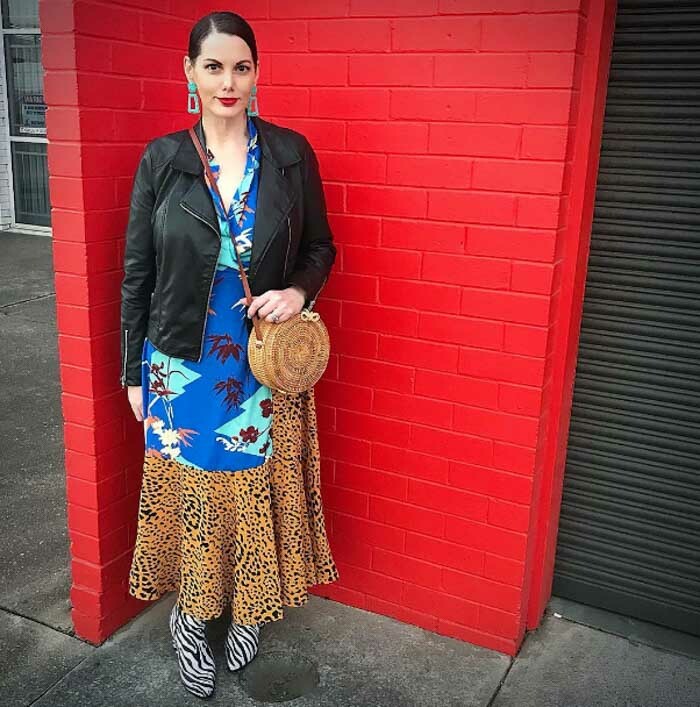 Showing just how popular snakeskin midi dresses are just now, this belted style is teamed with large hoop earrings, with red lipstick providing a splash of color. 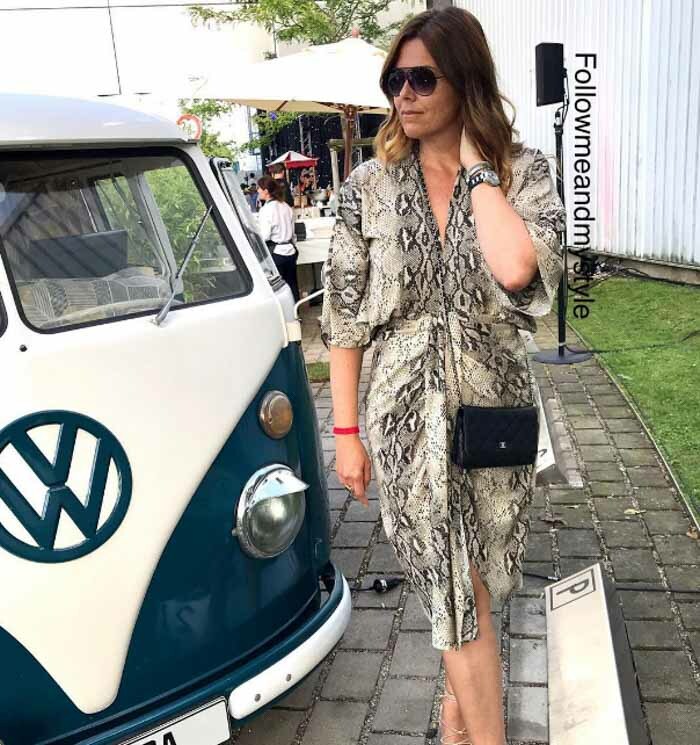 Showing another option for a snakeprint dress, here it is paired with a simple black crossbody bag, and on-trend flattop sunglasses. An, of course, a retro VW Campervan! A fantastic casual option. Here, a leopard print shirt is worn with jeans, with a pop of green adding interest. Want to know more about Greetje? You can read her style interview here. Read more about Greetje and her style here. 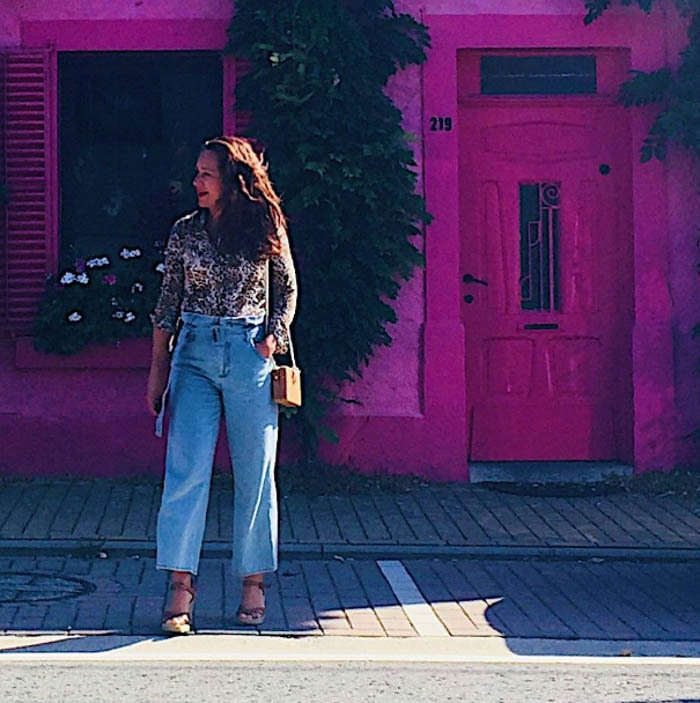 Another great casual look featuring a leopard print shirt and jeans, with an on-trend box bag, and a fabulous fuschia house! A simple, yet stylish, look which could be dressed up or down. Here, a leopard print tee and midi skirt are paired with sandals. How glorious does the lady above look in this fabulous coat with the animal print scarf and wide belt! This outfit above is so good, I want to copy it. The animal print jacket blends perfectly with the apple green and printed skirt and makes this such an interesting outfit. This lady mixes some very interesting colors and textures together resulting in a very stylish and chic outfit. Which of these outfits is your favorite? Do you already have a lot of animal print in your closet? I love animal prints! It is just a great basic. Thank you for showing all the ways to wear it. I’m glad you found it inspirational Deanna! I totally agree. 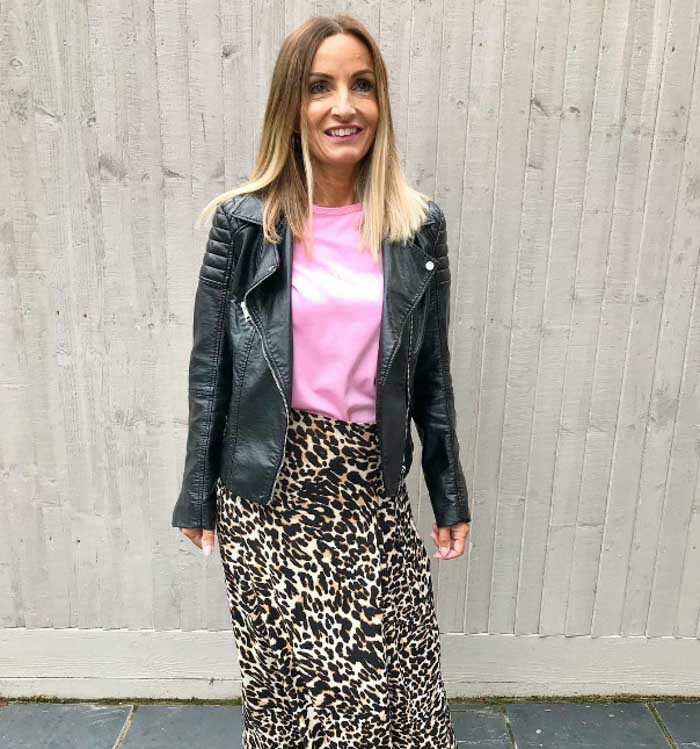 Animal print pieces are great investments as they’re always in style, but it can be tricky to think of new ways to wear old pieces. Leopard is huge by the look of all these wonderful examples. Well, better said: animal print. Thanks for including me, I am very pleased with that. Too bad my shoes aren’t showing as they were green as well. Never mind, the topic was leopard. For me, Lisa is the winner in her red leopard suit. Very good. 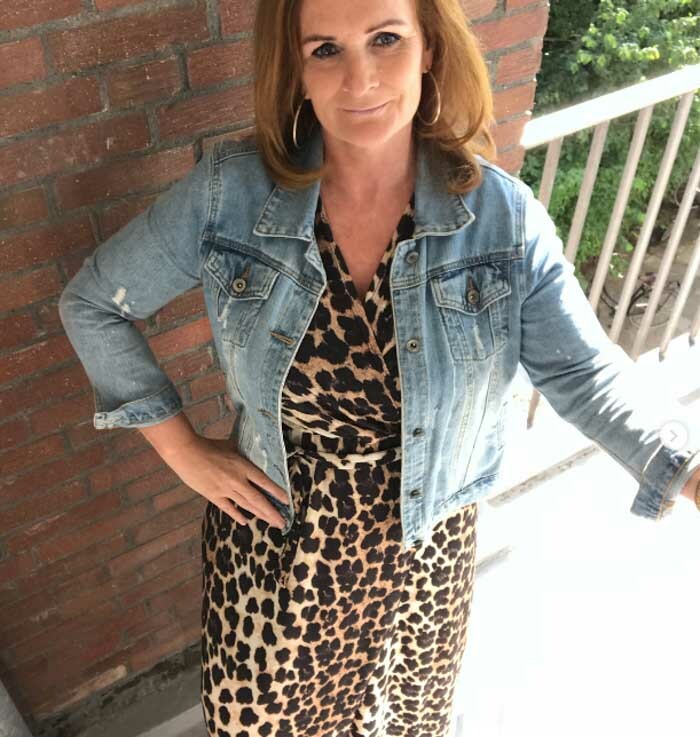 I love Leopard print and it is perfect to wear with other prints! So many beautiful outfits here, what an inspiration. I feel honoured to be part of this. Thank you! I would just like to be able to enjoy the pics of this site without having to wait until the tweet/FB/PI icons go away (on my smartphone). Always covers the pic on the right. Beyond annoying. Or is there an”app for that””? Next post: How to dress for thanksgiving: 5 outfits to choose from!